The first thing you notice about the YSP-5600 is that it has no less than 46 loudspeakers including separate amplifier stages, one might think that that those responsible for it produced it under the motto “more is more.” However, it presumptuous to assume such an experienced manufacturer like Yamaha would design this concept for no good reason. And so it turns on closer inspection that this highly sophisticated and accurate tuned speaker’s arrangement evidently is probably necessary to redeem the quite bold promise for the YSP-5600: The playback of up to 7.1.2 channels in other words, the adequate representation of a full 3D Surround mix, of course including the special level signals. In order to achieve the proper effect the six upward speakers of the Soundbar are located on the outer sides of the Soundbar six upward speakers that emit the appropriate signals to the ceiling while 32 over the entire area distributed driver mapped by exact meshing the classic surround channels. Two woofers that can be added for an even more convincing bass to the wireless subwoofer SWK-W16, finally, complete the system. Wing Yamaha places great emphasis on the fact that the resulting surround mix is ​​not only virtually created as in some other sound bars and then output via a stereo setup, but actually through the targeted distribution and delaying the individual surround signals including room reflections arises. Only when using the maximum number of channels (7.1.2) the information of the two center surround channels are mixed proportionally to the front and back surround channels (in the graph below in green). The distribution of all signals on the complex speaker system by means of the integrated DSP. Basically there are four different operating modes are available: “3D surround” for playback of Dolby Atmos (and DTS: X) signals, “surround” for normal surround mixes without height information, “Stereo” for a conventional stereo playback and “target” for the low-interference (mono) operating late at night with a very targeted directing sonic energy exclusively to the listening position. Moreover, can optionally be a number of presets for further influencing the overall sound activate when the YSP-5600 located in one of the surround modes. These are divided into three categories: “Movie”, “Music” and “Entertainment”. In addition, Yamaha allows customers an even broader configuration of the YSP-5600 in accordance with the given space situation, which can be done using the included IntelliBeam microphone either manually or automatically and includes, inter alia, the adjustment of the viewing angle with. In addition to the thoughtful speaker and DSP concept and the other equipment of the YSP-5600 Soundbar is remarkably extensive. The connection panel includes four HDMI 2.0 inputs, first and an HDMI 2.0 output, HDCP 2.2 are all compatible and 4K material with up to 60 frames per second pass (4K pass-through). There are also connectors for a subwoofer, an analog RCA, digital coaxial and two optical a TOSLINK inputs. Furthermore, the YSP-5600 has a respective IR in and IR-Out, an RS-232C interface, a USB port for installing firmware updates, the mandatory power cord connector and an Ethernet jack, the Soundbar into the home network integrate. On the one hand there is the possibility to offer various streaming services (Spotify, Napster, Juke) and Internet radio access, while on the other hand, locally stored media, for example via Apple AirPlay, the widespread DLNA protocol or in combination with other Yamaha devices via MusicCAST on The YSP-5600 can be streamed. As an alternative to wired variant allows the network integration thanks to the built-in WLAN module also realize wirelessly. If there is no network connection communicates the Yamaha soundbar or optionally via the short-range radio standard Bluetooth. Given the multiple networking functions, it is hardly surprising that the YSP–5600 not only with the supplied and moreover very clearly designed remote control, but also via smartphone or tablet can be controlled. 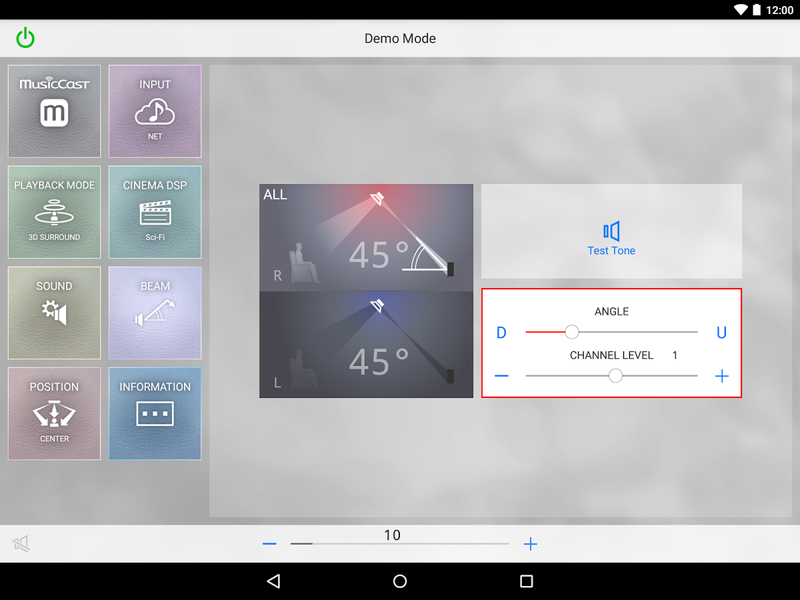 For this purpose is available for Android and iOS devices the “Yamaha Home Theater Controller” app in the respective stores for free download. The range of functions is thankfully been very plentiful, so that various detail settings, including the complete space adjustment can be made directly from the listening position in addition to the selection of sources, or changing the playback modes described above. 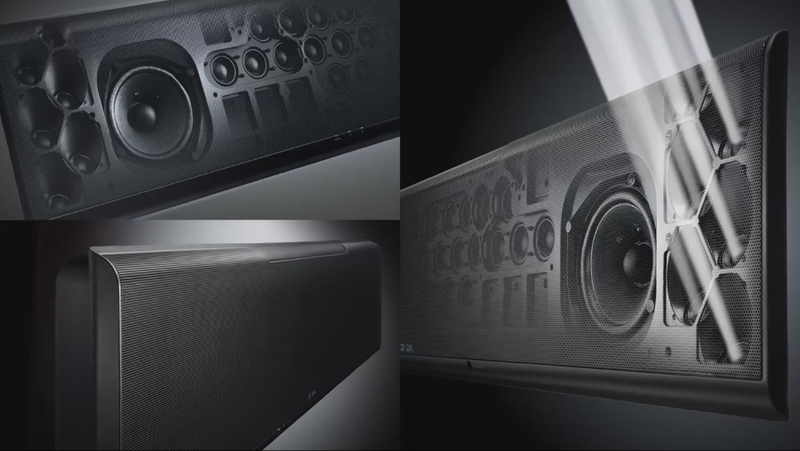 With an impressive package, consisting of not less than 46 individually driven speakers, the full support of most of the relevant standards, as well as diverse connection and profound adjustment possibilities leaves Yamaha’s new high-end Soundbar an extremely promising impression. The YSP–5600 is As already mentioned hearing as part of the Lange Nacht der Ohren for the first time with us and then also be regularly available shortly.